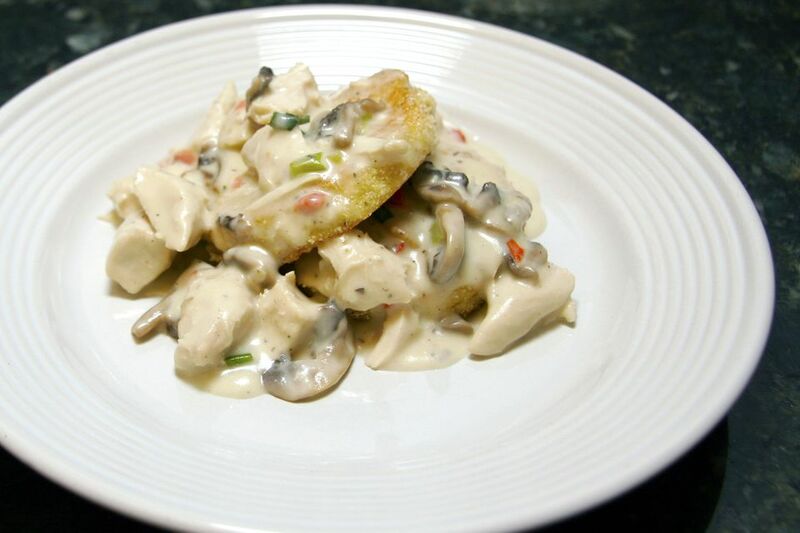 Chicken a la king is an American dish typically made with chicken, a creamy sauce, and pimientos. The origin is unclear, but theories range from prominent New York City restaurants and chefs to a London restaurant. The dish probably originated in the 1880s, but it was first mentioned in print in 1912. Chicken a la king is considered a comfort food by many people. The creamed chicken may be enjoyed over toast points, biscuits, or puff pastry shells. Or spoon it over rice, noodles, or potatoes. This version of the recipe is a classic combination of chicken, a variety of seasoning vegetables, and mushrooms. The condensed soup sauce is super easy to prepare and the slow cooker makes cooking a breeze. This recipe is also very useful because it has so many delicious variations. In the slow cooker, combine the chicken, bell pepper, onion, celery, pimiento or red bell pepper, mushrooms, and condensed soup. Stir gently to blend thoroughly. Cover and cook on low for 4 to 5 hours, or until the vegetables are tender. Turn to high and add peas; cook for about 30 to 40 minutes longer. Try tuna a la king. Use two 4.5-ounce cans of tuna (drained) along with the peas. Do you have any leftover ham? Use that instead of the chicken. Add about 1/2 cup of grated Parmesan cheese for a richer sauce and a rich ham and cheesy taste. Post-Thanksgiving exhaustion? Use diced leftover turkey instead of chicken in the slow cooker and put your feet up. Use frozen mixed vegetables instead of frozen peas. Or add some fresh vegetables for a twist.